Cambridge offers a world class opportunity to study the scientific basis of veterinary medicine and clinical veterinary science. Our course provides the fundamental building blocks on which to develop and excel in any veterinary field. The Department of Veterinary Medicine has an international reputation as a centre of excellence, and is performing world class veterinary research. A major strength of the Cambridge course is the extensive use of practical teaching and the emphasis on small-group teaching from Year 1. Our staff includes world leaders in their fi eld and our facilities include state-of-the-art equipment, a five-theatre small animal surgical suite, an equine surgical suite, an active ambulatory farm animal unit, a diagnostic unit, a superb post-mortem unit, all available for students during their clinical studies, and a Clinical Skills Centre that’s available to students in all years. We also have one of Europe’s leading cancer therapy units with a linear accelerator for delivering radiotherapy. We also have one of the leading cancer therapy units in Europe with a linear accelerator used for delivering radiotherapy to both small and large animals with cancer. In addition, our Clinical Skills Centre houses interactive models and simulators for students to practise and refine essential technical skills individually and as integrated clinical scenarios – excellent preparation for the case responsibilities you have in the later years of the course. The Centre is accessible to students in all years of the course. Small animals, farm animals and horses are housed on-site to provide continual opportunities to consolidate your animal handling skills. The nearby University Farm also allows all students to become involved in lambing and dairy management. Prospective applicants should be aware that lecture material is provided on an online platform and they should therefore have a suitable device, for example a laptop – Cost will depend on the type of device you choose to purchase. Costs dependent on the subject taken during Year. All students are required by the RVCS to complete 12 weeks during the vacations (at Cambridge, this is years 1-3). Costs vary depending on placements chosen – students should approach their College for travel grant support. The Department of Veterinary Medicine covers the cost of British Veterinary Association insurance cover for pre-clinical EMS placements at £40 per year. Many students choose to buy a higher quality stethoscope in later years, plus a fob watch for use in theatre (optional). All students are required by the RVCS to complete 26 weeks during the vacations (of years 4-6 at Cambridge). Costs vary depending on placements chosen. The Department of Veterinary Medicine provides a daily subsistence rate and travel allowance to assist with costs. The Department covers the cost of British Veterinary Association insurance cover for clinical EMS placements at £42 per year. Further details about additional course costs can be found on the Department website. Most of the equipment listed above can be purchased from the Veterinary School and if you require any further information/guidance, please contact the Department of Veterinary Medicine (see fact file, right). Some students may be eligible for the Cambridge Bursary Scheme and some College funding may be available to support students’ studies, see individual Colleges for details. If numbers permit and they satisfy the entry requirements for Veterinary Medicine, students studying another science course at Cambridge may be able to change to Veterinary Medicine. This would usually happen at the end of the first year, though students would have to take up Veterinary Medicine from the start of the first year. Students interested in changing to Veterinary Medicine should seek advice from the Director of Teaching at the Vet School in addition to their Director of Studies. Occasionally, having studied the first year of Veterinary Medicine, students have left the course and changed to Natural Sciences, starting in the second year. 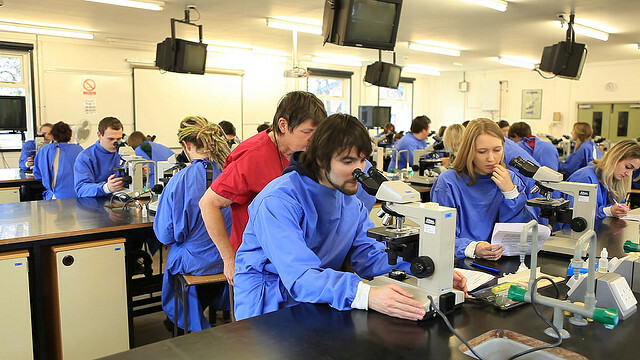 While the University is responsible for the teaching and examination of the courses leading to the BA and VetMB degrees (awarded after three and six years, respectively), their content and standards are scrutinised by the Royal College of Veterinary Surgeons (RCVS) and must also conform to the Veterinary Directives of the European Union. Achievement of the VetMB degree allows you to become a member of the RCVS – the professional qualification required to enter practice. The Cambridge course equips you with the clinical skills and scientific understanding required to enter practice and other areas of veterinary work. Many of our graduates subsequently enhance their clinical skills by obtaining further professional qualifications in a wide variety of clinical disciplines. However, the Cambridge veterinary course also gives you the scientific understanding needed to enter many other areas of veterinary work or biomedical science, and to understand and respond to the rapid progress being made in veterinary science. For example, there are opportunities to enter research in universities, Research Council institutes and private companies, and to obtain specialist postgraduate qualifications. In addition, career openings are available with government agencies, animal charities (RSPCA, PDSA etc), pharmaceutical companies, and in academic clinical posts. At Cambridge, you study the basic veterinary sciences first before learning to apply that knowledge to veterinary practice as a clinical student. During your pre-clinical studies (Years 1-3), you are taught through lectures and practical classes (including 120 hours of dissection across the three years) in the central science departments, and College supervisions – you can typically expect 20-25 timetabled teaching hours each week. The clinical studies teaching is a mixture of lectures (in Years 4 and 5), practicals, tutorials, supervisions and clinical rotations. In addition, you must complete a minimum of 12 weeks’ work experience (pre-clinical extramural study) during the University vacations in Years 1 and 2 to gain knowledge of animal husbandry. During your clinical studies, you must complete at least 26 weeks of clinical extramural study, some of which may be undertaken abroad. You are supported in the activities by your Vet School Clinical Supervisor. Your progress is continually reviewed by your supervisors and your Director of Studies. Formal assessment, which determines your progression through the course, takes a variety of forms including written essays, short answer questions and practical examinations. In Years 1 and 2, you are taught the core scientific knowledge and skills needed as a veterinary professional. Taught by some of the world’s top academic scientists and veterinary surgeons, we provide you with the scientific and practical basis that will allow you to develop your veterinary career to the full, whether your aim is to deliver outstanding care or to push forward the boundaries of academic veterinary medicine. In addition to core science, you follow the Preparing for the Veterinary Profession course (an introduction to the ethical, social and professional responsibilities of the profession) and courses in animal handling and management. Read more about Years 1 and 2 on the Faculty of Biology website. This feature of the course gives you the opportunity to specialise in an area of interest to you, expanding your knowledge and preparing you for a career after graduation. Following this, you then continue to the three years of clinical studies at the Department of Veterinary Medicine, which is just a short walk or bike ride from the city centre. The emphasis of the clinical studies is to give you sufficient clinical knowledge and skills to begin to practise veterinary medicine (‘day one competencies’) and also to provide you with the scientific background you need to benefit from future trends and advances in veterinary medicine. You also learn about veterinary public health, including food hygiene, state veterinary medicine and the medicine of rabbits, rodents, reptiles and birds. Clinical tuition begins with basic clinical methods and integrated teaching in the husbandry/management and medicine of horses and farm species. Two mornings each week are given over to practical clinical work including basic clinical examination of the main domestic species, radiography and post-mortem investigation. You also develop a range of technical and practice-related skills in the Clinical Skills Centre. Five mornings every week are again set aside for practical clinical work. This includes visits to external establishments such as the University-affiliated RSPCA clinic, and opportunities to further hone your consultation and practical skills in the Clinical Skills Centre. Part II of the Final Veterinary Examination tests your understanding of principles and concepts of veterinary medicine, as well as your ability to integrate information across the Part I series of subjects. This is a 40-week lecture-free year with tuition centred on clinical teaching, in which groups of just three or four students rotate through different disciplines in the hospital with individual clinicians. The small size of these groups means each student’s caseload is higher and they are given the maximum possible responsibility for the management of clinical cases. This allows you to develop your clinical and problem-solving skills and client communication skills in a real clinical practice environment. Finally, you have a period of eight weeks’ elective study in which to explore a special interest. During the year, marks awarded in continuous assessment count towards Part III of the Final Veterinary Examination, which is examined in May of the final year. Achievement of the VetMB degree allows you to become a Member of the Royal College of Veterinary Surgeons (MRCVS), which is the professional qualification required to enter practice. For further information about studying Veterinary Medicine at the University of Cambridge see the Department of Veterinary Medicine website. You may enter up to four veterinary medicine/science courses in your UCAS application. Your remaining choice can be used for an alternative course without prejudice to your commitment to veterinary medicine. See Veterinary Medicine: Subject Requirements and Typical Offer by College for College-specific requirements/preferences. All undergraduate admissions decisions are the responsibility of the Cambridge Colleges, so please check College websites for further details. Please note that in the following ‘science/mathematics subjects’ refers to Biology, Chemistry, Physics and Mathematics. It does not include Psychology. A Levels in Chemistry and one of Biology, Physics, Mathematics. Most applicants have at least three science/mathematics A Levels and some Colleges require this and/or particular subjects. See individual College websites for details. A Level subject requirements also apply to the IB – Higher Level subjects satisfy A Level subject requirements. We expect applicants taking other recognised examinations to demonstrate a level of understanding in science and mathematics roughly equivalent to those applying with A Levels. Refer to the Entrance requirements page for details of other qualifications and please consult any College Admissions Tutor for further advice. Work experience is not a requirement for applicants but some experience is useful to understand the profession and what is required of its members. We recommend applicants acquire two weeks of work experience, if possible. All applicants to Veterinary Medicine are required to take the Natural Sciences pre-interview written assessment at an authorised centre local to them (for a lot of applicants, this will be their school/college). See Natural Sciences pre-interview written assessment for more information about the assessment format, and to download past papers. All Veterinary Medicine applicants (including those applying to a mature College) will take the Natural Sciences pre-interview written assessment on 30 October 2019. Please check the Cambridge Assessment Admissions Testing website for scheduled start times. We are looking for students who are committed to the veterinary profession, and who are really interested in the scientific principles that underlie both the health and disease of animals. The Royal College of Veterinary Surgeons (RCVS) has certain expectations regarding the attitudes, behaviour and performance of veterinary students. Trainee veterinary surgeons at Cambridge must satisfy the RCVS fitness to practise requirements, both when applying and throughout the course. These requirements are in place to ensure the safety of patients and patients' owners. If you are offered a place to study Veterinary Medicine at Cambridge, you're required to undergo an enhanced Disclosure and Barring Service (DBS) check. Overseas students are asked to provide similar evidence. Where courses may involve regular access to children and/or vulnerable adults, students are legally required to undergo an enhanced DBS check. The University will send further instructions on registering with the DBS as part of the admissions process. Minor misdemeanours will not necessarily prevent you from entering the veterinary profession but you should declare these in your UCAS application and you will be sent the relevant forms to complete if you are offered a place. More details can be found on the University's Disclosure and Barring Service (DBS) webpage and on the Faculty of Biology website. Veterinary surgeons, even as students and trainees, have a responsibility to be honest and open about their own health and all successful applicants are required to complete a confidential occupational health assessment. A questionnaire will be included with your offer letter and, once completed, should be returned to the University’s Occupational Health Service. The assessment is also to identify any long-term health conditions or disabilities that you have which require specific support, so that this can be in place before you start the course. All veterinary students will be seen in Occupational Health at the start of the course for allergy screening and to commence health surveillance due to the work with animals that will be undertaken. A disability, SpLD or long-term health condition needn't prevent you from becoming a veterinary surgeon if you can satisfy the professional fitness to practise requirements. In these circumstances please contact a College Admissions Tutor, or the Director of Teaching at the Department of Veterinary Medicine as early as possible to discuss your needs and the course requirements. Such disclosures are considered independently of academic qualifications and the interview process. The University's Disability Resource Centre (DRC) can provide general advice and guidance to prospective and current disabled students and those with a SpLD or long-term health condition. Department of Veterinary Medicine - Explore Veterinary Medicine in more detail on the faculty website. Basic Science Concepts - Basic concepts you will be expected to be familiar with during your first year. Costs of Studying Medicine or Veterinary Medicine at Cambridge - Information on the additional costs associated with the study of Medicine and Veterinary Medicine. Rules and legal compliance - All offers to study Medicine or Veterinary Medicine are dependent on an enhanced disclosure from the Disclosure and Barring Service for UK applicants. Royal College of Veterinary Surgeons - Royal College of Veterinary Surgeons website. Available at all Colleges except Christ's, Corpus Christi, Hughes Hall, King's, Peterhouse and Trinity.